"Whoever Serves Me Must Follow Me"
Follow the Leader is actually a pretty simple game. Follow Jesus - and do what He does. Key Verses: John 12:26, Matthew 16:24, Matthew 10:28, Luke 6:46, John 3:16-18, John 6:66-69, John 15:20-23, Revelation 6:15-17. The first words of Jesus' ministry were "Follow Me." He did not promise health, wealth, comfort, or safety. But He did ask that we give up everything for His sake. We often think of Jesus as a teacher and a sacrificial lamb, yet forget that He is also the judge who will come back to judge mankind. Like the disciples, we follow Him to learn of the Kingdom of Heaven, but also because He holds the keys to eternal life. About "Basic. 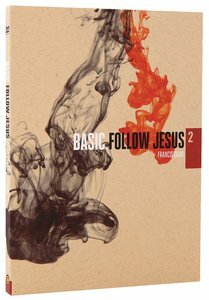 #02: Follow Jesus (#02 in Basic. Dvd Series)"
The Christian life was meant to be a journey, not a routine. BASIC is a seven-part short film series from the creators of NOOMA featuring Francis Chan inviting us to reclaim the simple, full, and beautiful journey that our lives are intended to be. The first three BASIC films begin at the most fundamental level asking, "Who is God?" Francis addresses, reveals, and reinforces a foundational framework to better understand the complex truths of the Father, Son and Holy Spirit. Films four through seven focus on "The Practices of the Church," and by living these out, we are the Church. We're all looking for a solid foundation - something we can build our lives around. We crave a profound assurance that God, His ways, and His Word will carry us through - leading to basic conclusions to complex questions we wrestle with. BASIC is a seven part series of short films - from Flannel, the award winning creators of the NOOMA film series - that challenge us to reclaim the church as Scripture describes it to be. This series will speak to those who have questions about the church and to those who may have lost interest in the church.